Every child, regardless of severity of disability, is capable of communicating. 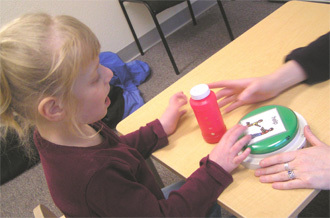 Children who are nonverbal can be taught to communicate with picture-based communication systems. These can range from "no tech" (pointing to pictures on a board, or handing a picture to the communication partner) to "high tech" (sophisticated electronic speech-generating devices). Shelly specializes in entry-level augmentative communication, using techniques such as Picture Exchange Communication System and simple communication devices. Some children can even learn to use verbal words through the use of AAC devices.